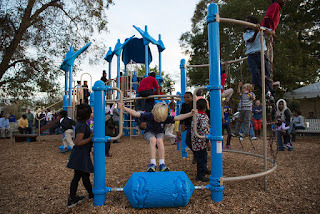 What's your child's favorite activity on the playground? Whether they enjoy tag games, the swings, or four square, they learn essential skills as they play. I took a few minutes today to jot down nine skills my girls and your kids learn as they play on the playground. Learn about the value of play, then head out and have fun! As kids of all ages swing, jump, balance, and slide, they develop motor skills that help them walk, run, and even hold a pencil better. Research shows that imitating other kids, particularly while climbing, improves motor skills, and balancing on a bridge or balance beam hones locomotion skills. Even holding onto monkey bars, following the leader, and grasping the swings' chains develop essential motor skills. I don't know about your local playground, but ours attracts a cornucopia of kids. They're different ages, sizes, and personalities, and that means my girls gain plenty of opportunities to learn how to get along with anyone. I love watching them negotiate game rules, assert themselves when someone gets too bossy, and encourage shy kids to join in the fun as they play. On the playground, my girls exercise and don't even realize it. Pumping the swings, climbing the rock wall, and working the see-saw gives them a full-body workout and improves their physical health. Inclusive playgrounds are some of my favorite innovations. I love watching kids of all abilities play together thanks to the wheelchair accessibility and specially designed equipment. My girls also learn to include and appreciate kids of all abilities, two valuable skills they need for success in life. We've all watched our kids lose their cool on the playground, but that doesn't mean we avoid playgrounds. Instead, I appreciate that my girls get to practice their ability to tolerate frustrations, exercise self-control, and walk away from trouble all while interacting with their playmates. If you've ever watched kids play together, you know that it doesn't take long for them to start using their imaginations. Whether they pretend the jungle gym is a castle, hide from aliens in the tubes, or invent conversations while using talk tubes, I love watching my girls use and stretch their imaginations on the playground. When my girls were toddlers, I held them as they sat on the see-saw, walked on the balance beam, and slid down the slide. Practice and time, though, have improved their balance and coordination. Your kids learn these skills, too, as they play. Toddlers who are just learning how to talk do so primarily through practice and imitation. Rhyming games and songs are two activities that help kids develop language skills on the playground. Older kids, too, learn to communicate in meaningful ways as they interact with others kids as they play. At home, in the classroom, and after school, our kids follow a structured schedule. They need time to play whatever they want in the way they want. I know I enjoy watching my girls pretend they're dragons, work hard to master the monkey bars, and giggle on their favorite swing. On the playground, they're free from structure and able to just relax and be themselves. 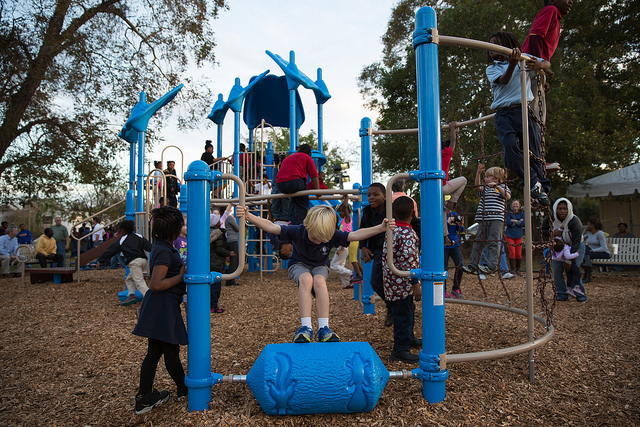 Playgrounds do more than give kids something to do after school or on the weekend. They're education centers that teach, hone, and develop essential skills. What skills will your kids learn at your local playground today?